Assessing anti-rabies baiting – what happens on the ground? Rabies is one of the most hazardous zoonoses in the world. Oral mass vaccination has developed into the most effective management method to control fox rabies. The future need to control the disease in large countries (i.e. Eastern Europe and the Americas) forces cost-benefit discussions. The 'Increase bait density' option refers to the usual management assumption that more baits per km2 could compensate for high fox abundance and override the imperfect supply of bait pieces to the individual fox. We use a spatial simulation, which combines explicitly fox space use (tessellation polygons) and aeroplane flight lines (straight lines). The number of baits actually falling into each polygon is measured. The manager's strategic options are converted into changes of the resulting bait distribution on the ground. The comparison enables the rating of the options with respect to the management aim (i.e. accessibility of baits). Above 5% (approx. 10%) of all fox groups without any bait (at most 5 baits) relate to the baiting strategy applied in the field (1 km spaced parallel flight lines, 20 baits per km2 distributed) under habitat conditions comparable to middle and western Europe (fox group home-range 1 km2, 2.5 adults; reference strategy). Increasing the bait density on the same flight-line pattern neither reduces the number of under-baited fox group home-ranges, nor improves the management outcome and hence wastes resources. However, reducing the flight line distance provides a more even bait distribution and thus compensates for missed fox groups or extra high fox density. The reference strategy's bait density can be reduced when accounting for the missed fox groups. The management result with the proper strategy is likely the same but with reduced costs. There is no overall optimal strategy for the bait distribution in large areas. For major parts of the landscape, the reference strategy will be more competitive. In situations where set backs are attributed to non-homogeneous bait accessibility the distribution scheme has to be refined zone-based (i.e. increase of the flight line length per unit area). However, increase in bait density above the reference strategy appears inappropriate at least for non-urban abundance conditions of the red fox. Disease managers worldwide spend huge effort on combating rabies by oral mass vaccination of wildlife hosts [1, 2]. The European rabies control programs of the last two decades focused on the red fox population as the principle rabies reservoir . During the 1980s, baits were predominantly distributed by hand with the assistance of local hunters and forest rangers . However, with the rapid enlargement of vaccination areas, there was a need for alternative methods to make long-term and large-scale treatment feasible . Aerial distribution of baits proved to be a method, which can be used for any terrestrial rabies reservoir species attainable via baits providing an efficient oral rabies virus vaccine is available [5, 6]. So, since the 1990s aerial bait distribution has been utilised more and more, using both fixed wing aircraft or helicopters [7, 8]. Aerial distribution led to improved oral vaccination programmes in terms of higher bait-uptake and increased sero-conversion rates [9, 10]. The applied vaccination strategies, however, differed in detail from country to country . Due to uncertain knowledge about the abundance of foxes, especially the bait distribution schemes have been established empirically (i.e. adjustment of campaigns, baits per km2 or flight line patterns [1, 8, 11, 12]). Although oral mass vaccination of foxes was generally successful, many European rabies control programmes gained less convincing results of long-term control as expected from theoretical planning. The insufficiencies became aware when population immunity levels were measured low or the time horizon until final eradication was longer than assumed [1, 2, 13]. Dissatisfying control efficacy is usually hypothesised to be the result of insufficient bait density [14–16] relative to dense fox populations [12, 17, 18]. It was expected that more baits per km2 could compensate for high fox abundance and override imperfect supply of bait to each individual fox, which we refer to as the 'Increase bait density' option. Thus, the amount of baits distributed per unit area (i.e. b.p.km2) was steadily increased from an average of 18–20 up to a peak value of 35 b.p.km2 [2, 15, 19]. However, the accruing input resulted in a rather limited improvement in the target measures. Indeed, the attainable protection level in foxes was observed to tend to a saturation clearly below 100% [20–22]. Thus it's evident that we need an adapted baiting strategy which is based on an understanding of the reasons responsible for the saturation . The study is based on an idea on the potentially nonhomogeneous access to baits of individual foxes (see , and Fig. 1). We introduce a spatial explicit model that breaks down large-scale management to an accurate local scale of fox group home-range areas. With respect to given management aims we analyse the effects of varying fox density, increased bait density, and changed flight line patterns. The virtual application of different baiting strategies pinpoints the resource wasting suggested by the 'Increase bait density' option, and relates imperfect supply of baits on the ground to wrongly chosen flight line patterns. The results indicate how this new knowledge might help to solve the runoff into the long-lasting bait density debate. The 'Non-homogeneous bait coverage' hypothesis Schematic representation of the hypothesis of violated 'Homogeneous bait coverage' due to randomly missed fox group home-ranges. After Breitenmoser & Müller (1997, ). There are two levels required for the model design: (i) The manager's perspective determines the flight line pattern by distance between lines, and then the number of baits per kilometre flight line in accordance with the aimed overall bait density in the control area. And (ii) the fox perspective, which accounts for the actual bait density per area of home-range as perceived by the foxes. We developed a spatially explicit model in C++ that simulates the intersection of flight lines with stochastic landscapes of spatial polygons representing spatial units of fox families (Fig. 2; a Windows version of the tool would be available through the authors upon email request). 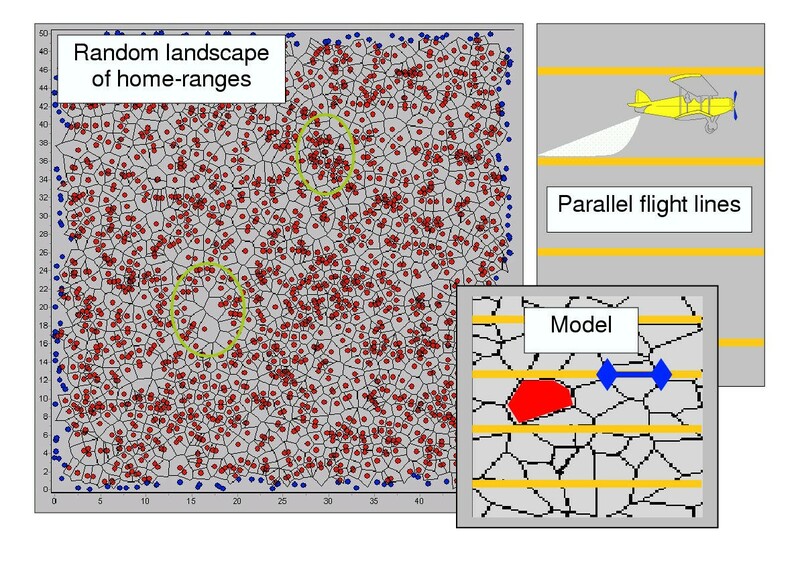 Schematic representation of the model Schematic representation of the components of the model: Randomly generated landscape of fox group home-ranges (including high and low density areas), the parallel flight lines randomly intersected with the 'fox landscape', and the measurements in the model (i) length of flight line segment in each polygon, (ii) number of empty polygons. We produce a subdivision of the rectangular simulation area into spatial units using Voronoi-tessellation . The Voronoi-method is used to represent the allocation of space by individuals competing for heterogeneous space resources . In brief, pN centre points are distributed randomly over the simulation area and are subsequently assigned with polygons, which are determined by the rule that each edge halves the distance to one neighbouring point. The area of each polygon is then calculated. The model parameter pN specifies the number of fox families and the polygons represent the simplified fox group home-ranges. Together with the simulation area's horizontal and vertical length selection (pMaxX, pMaxY), pN is also used to adjust the fox family density to the needs of the simulation experiments. Therefore, no additional assumption about the relation between size of the fox group home-ranges and the population density is necessary. Parallel horizontal straight lines represent flight lines. Starting with a randomly placed first line, the gap between two consecutive straight lines is determined according to the choice of the parameter pLineDist. Given that pLineDist, the parameter for the aimed bait density (i.e. pBaitDens) is converted into the required distance between two dropped baits. For example in order to distribute 20 baits per km2 with a flight line spacing of 1 km one bait must be dropped every 50 meters (i.e. 1/pBaitDens * 1/pLineDist = km2/20 * 1/1 km = 0.050 km). The dropping starts randomly on each straight line and is then repeated at regular intervals. The sections of all straight lines passing through each polygon are calculated. Then the explicit number of baits within the line segments are counted and stored to the polygon. Baits falling on polygon edges are counted for both adjacent polygons because animals from each polygon could find the piece. Eventually the actual bait density within each polygon is calculated. In the simulation experiments, the main parameters were systematically varied (i.e. mean area of the group home-range from 0.5 up to 2.5 km2 (via pMaxX*pMaxY), pLineDist from 0.1 up to 3.0 km, pBaitDens from 10 up to 35 b.p.km2). For every parameter scenario, the outcome is averaged over 100 repetitions (i.e. frequency distribution of locally realised bait density values and frequency distribution of absolute bait numbers in the polygons). The procedure of Voronoi-tessellation is performed for every repetition to cover the effect of the stochastically selected segment of a larger landscape. Only polygons completely contained inside the tessellated area are included in the analysis thus excluding edge effects. Applying the reference strategy from the field (i.e. 20 b.p.km2 dropped with a flight line distance of 1 km) we found that on average 5.4% (up to maximum 6.4%) of all fox group home-ranges completely failed to get any bait under ecological conditions as known from non-urban European fox populations (i.e. mean group home-range 1 km2). Around 45% of all fox families achieved more than 20 baits (mean of all targeted polygons = 21.2 b.p.km2; Fig. 3). Frequency distribution of local bait densities Full frequency distribution of local bait densities found under the reference or field scenario (pBaitDens = 20; pLineDist = 1 km; pN = 2500; MaxX*MaxY = 2500 km2), whiskers represent MIN and MAX of 100 repetitions. The segments of the inserted bar diagram illustrate the percentage of spatial units with a particular number of baits (red 0; orange 1–5; light orange 6–10; yellow 11–15; green 16–20; dark green > 20 baits). Management aim of 20 b.p.km2 is exceeded on the group home-range level where mean bait density is measured as 21.1 b.p.km2. 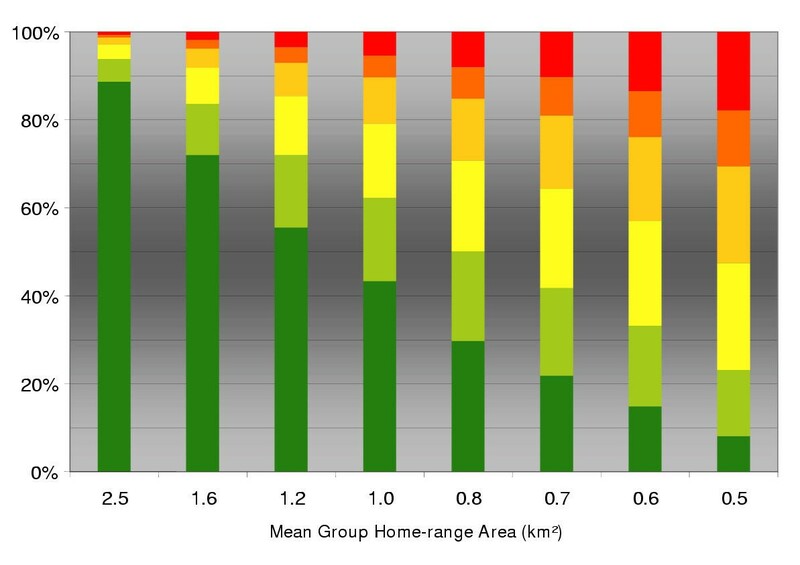 By changing the mean area of fox group home-range down to 0.5 km2 (i.e. increased fox group density) the discrepancy between aimed and resulting bait density becomes serious. In particular the amount of completely non-baited polygons increased by up to 18% (30% with a maximum of 5 baits). On the other hand, large fox group home-ranges (i.e. 2.5 km2) result in over-baiting with 89% of fox families reaching more than 20 baits (Fig. 4). The effect of group home-range size The effect of mean area of family group home-range (i.e. fox density) on the distribution of absolute bait numbers in individual fox groups under the field strategy (pBaitDens = 20; pLineDist = 1 km). Bar segments depict the percentage of spatial units with a particular number of baits (red 0; orange 1–5; light orange 6–10; yellow 11–15; green 16–20; dark green > 20 baits). Fig. 5 resembles the changing bait distribution when increasing the overall bait density (flight line distance and home-range area remains constant). As anticipated, the increase in dropped baits does not alter the critical part; indeed, up to 6.3% (mean 5.3%) of fox families still failed bait targeting. The only noted effect is a drastic increase in the proportion of over-baited fox group units. In Fig. 5(b), the recalculated result displays the relative deviation of the local bait densities from the management aim, to highlight the waste of resources. The effect of varying bait density The effect of varying bait density (i.e. management aim) on the distribution of absolute bait numbers in the individual fox group under the field strategy (pLineDist = 1 km; mean fox group area ~1 km2). (a) Bar segments depict the percentage of spatial units with a particular number of baits (red 0; orange 1–5; light orange 6–10; yellow 11–15; green 16–20; dark green > 20 baits). (b) Bar segments depict frequencies of the relative deviation of the resulting local bait density from the aimed density of the campaign (pink -100% to -75%; lilac -74% to -50%; aubergine -49% to -25%; blue -25% to +50%; dark blue above +50% deviation of management aim of 20 b.p.km2). Fig. 6 shows the importance of proper adjustment of the flight line distance. The reduction of the reference flight line distance (i.e. 1 km) by 50% will reduce the amount of total failure to zero. Thus, each fox group is guaranteed to receive at least one piece of bait. Additionally, the proportion of saturated polygons (>20 baits) remain barely changed. A further reduction of the flight line distance does not change the outcome qualitatively when the other parameters remain constant. The effect of varying flight line distance The effect of varying flight line distance (i.e. management strategy) on the distribution of absolute bait numbers in the individual fox groups under the field strategy (pBaitDens = 20; mean fox group area ~1 km2). 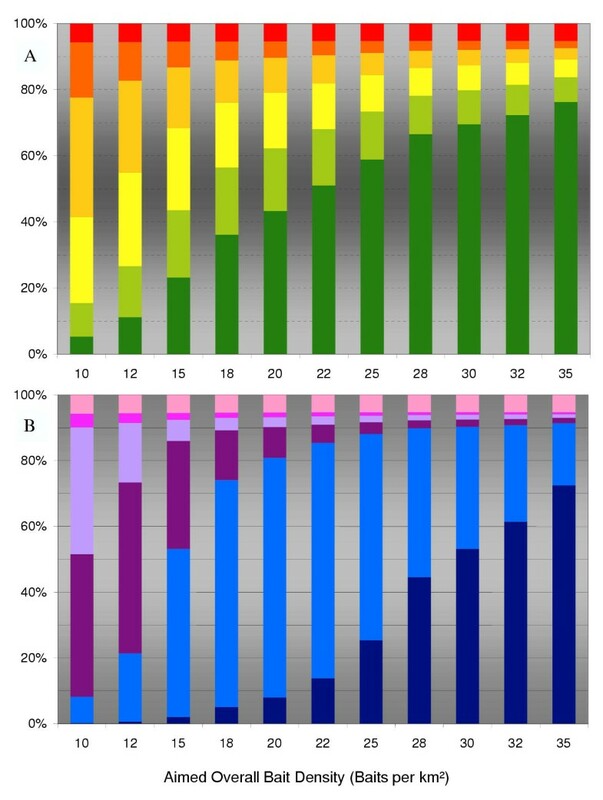 Bar segments depict the percentage of spatial units with a particular number of baits (red 0; orange 1–5; light orange 6–10; yellow 11–15; green 16–20; dark green > 20 baits). 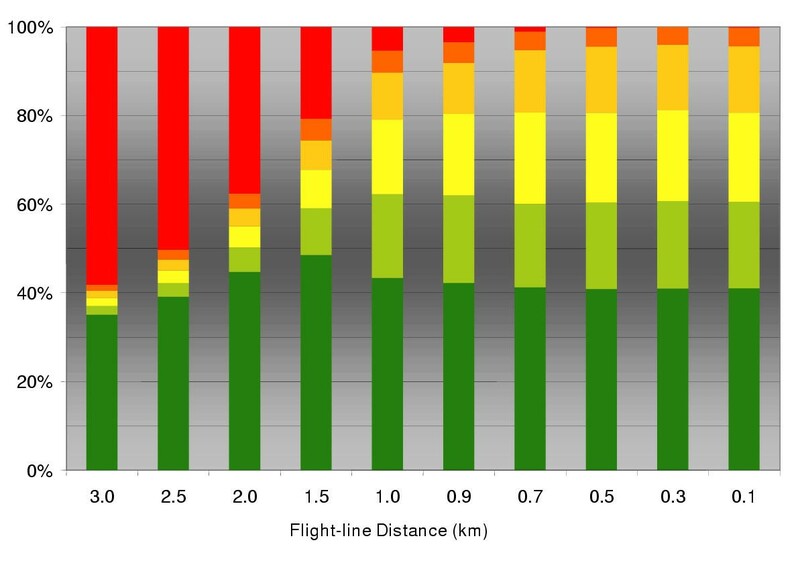 Very small flight line distances cannot improve the ground pattern further, as small sized home-ranges can only contain a maximum number of baits even with perfectly uniform distribution. Over the past 25 years there has been convincing studies which reveal the successfulness of oral mass vaccination in wild-life on the population level [2, 8, 19, 20, 26–28]. However, the future fight against the disease remains both a political and economic concern due to the continued worldwide threat to public health through rabies. Consequently, the preparation of future wildlife control activities and the shortcomings of the performed vaccination programs have to be discussed. Particularly, the applied strategies must be subjected to more detailed analysis in order to increase the efficacy (i.e. emergency control) and improve the cost-benefit (i.e. challenge of the large-scale areas of Eastern Europe or the US). The management aim of oral vaccination is for every fox to have access to vaccine baits. Exact figures about the bait uptake by single individuals have rarely been available [29, 30]. Most studies report bait uptake estimates based only on the population level [15, 31], or even as a diminishing rate . Consequently, bait density has been designed empirically according to population estimates and minimum bait number per capita [11, 12]. From this point of view, the discussion on changes in baiting strategy has usually focussed on the quantity of baits necessary to control rabies in an area under treatment. We contribute a qualitative aspect by taking into account how a given number of baits are distributed within local fox group home-ranges. The manager's objective (i.e. the overall bait density per unit area) was, with the respective model, compared to the resulting bait pattern on the ground in order to evaluate different strategic options. We perform the analysis based on a reference strategy, i.e. 1 fox group per km2, 20 b.p.km2 and 1 km distance between parallel flight lines. This baseline scenario reflects the strategy often applied successfully in the field [19, 33]. The question was how to find useful changes to this strategy when set backs in a control area were recognised. The most popular strategic alternative relates to the 'Increase bait density' option or more baits per unit area are suggested to clear insufficiencies in bait supply. The understanding gained from the results forces the rejection of this alternative. Indeed, the major assumption behind the 'Increase bait density' option is violated because the homogeneously planned and precisely performed baiting (i.e. the manager's scale) results in non-homogeneous spatial bait patterns on the ground (i.e. the fox perspective). Moreover, the latter cannot be overridden purely by putting more baits into the area. In particular, we have recognised more than 5% (up to 10%) of fox groups, which have no baits (a maximum of 5 baits) in their spatial unit. This is reasonable as the target individuals forage in discrete spatial units [34–38] and we must apply our management on discrete (flight) lines. The interference of both processes appears to be random due to limited knowledge on our part (i.e. no map for home-ranges available). Thus, the outcome of our perfectly planned management is largely, not predictable. This insight fits into the recent discussion of spatio-temporal heterogeneity on various scales which can dramatically deform the assumed straight forward link between management plan and its result [39, 40]. Clearly the particular figure of 5.4% is determined by the parameterisation according to the reference conditions found for example in rural Europe (i.e. fox group density ~1 per km2 with around 2.5 adult foxes per group [15, 41]; applied bait density of 20 b.p.km2; 1000 m distance between parallel flight-lines ). The percentage of randomly missed spatial units will dramatically increase in areas which provide better habitat conditions and hence carry greater numbers of fox groups per unit area. The estimated amount of missed groups exceeds 15% (Fig. 4) when very small group areas with a mean of only 0.5 km2 are included. Obviously, under such extreme ecological conditions one must have serious doubts concerning the successfulness of the respective control program and should adapt the strategic parameters accordingly. A simple increase of the bait density parameter can definitely not be the option of choice in high-density situations (Fig. 5) – even with unlimited financial resources. Distributing more baits does not alter anything other than putting a lot of feed into the successfully targeted group units. 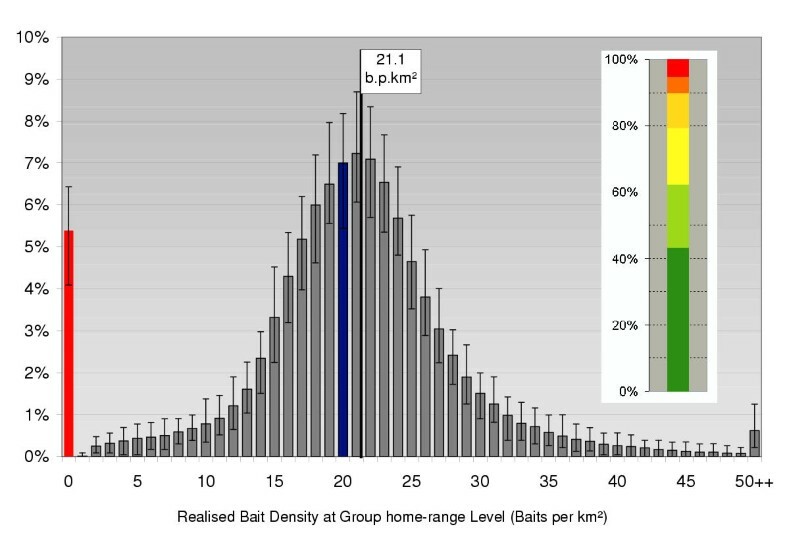 In Fig.5(b), we recognise from the reference scenario that baiting densities exceeding 30 b.p.km2 will result in more then 50% of fox group home-ranges where the effective bait density deviates by more than +50% of the planned figure of 20 b.p.km2. Nevertheless, several campaigns have used even more baits, namely up to 800 b.p.km2 . The change in strategy suggested by the 'Increase bait density' option proved to be futile and thus inappropriate because the proportion of fox groups not reached by the flight pattern remains constant. Indeed, the bait distribution pattern remains undefined until choosing the distance between flight lines. This measure determines the distance between single baits according to the intended bait density. In Eastern Germany, where large-scale vaccination was applied right from the onset of oral vaccination, flight line distances of 1 km for aerial distribution proved to be very successful and resulted in a rapid eradication of the disease . However, in particular sub-regions sporadic cases of rabid foxes indicated a prolonged persistence of the infection on a very low incidence level [1, 42]. Within these particular regions, some assumptions of the management plan might have been violated (i.e. including potentially higher population density); consequently, the baiting strategy must be adapted here. Baits must be distributed more evenly in order to increase the chance of more individuals having access to baits as opposed to providing more baits to those already reached. The most suitable strategic option in this situation is therefore the reduction of the flight-line distance (Fig. 6). Particularly, after assuming increased fox density to be limiting the vaccination result (i.e. when fox group areas are thought to shrink), the reduction of flight line distance is the only choice for an adaptation of the strategy. This finding is reasonable because a distribution of the same amount of baits along a prolonged flight line produces a finer and more regular distribution on the ground. Thus, the chance of completely missing a complete fox group home-range (or even hitting it with less than a minimum number of baits) diminishes. There is an intuitive alternative used in the field very recently, namely "double baiting" which refers to a repetition of baiting, perpendicular to the first flight line pattern . Within expert discussions the success gained with this strategy (for example in Baden-Wuertemberg, Germany, Breitenmoser unpubl.) is attributed to a "booster effect". However, the success is more likely related to the finer distribution of baits on a doubled flight line. Yet, either "double baiting" or a reduction in flight line distance should be applied without increasing the amount of baits distributed (i.e. constant overall bait density). The appeal of the strategic adjustment is acceptable cost-benefit. The total flying costs for 1000 m amount to 1.50 Euro . Thus, the distribution of 20 b.p.km2 with a flight line spacing of 1 km equates to 0.075 Euro per bait, added by 1 Euro that the bait itself costs [1, 44, 45]. If flight line distances are reduced to 0.5 km (i.e. doubling flight line length) the cost per bait increases by 7% due to the additional flying expenses (i.e. baseline cost of 1.075 Euro per bait increases to 1.15 Euro to distribute the same number of baits). Therefore, excluding missing group home-ranges cost additional 7% of the original budget. Learning from the control programmes performed in the past with the reference strategy there were more control areas without setbacks. Thus, the reduced flight-line distance is not mandatory to achieve eradication success. Within these areas of success, ecological conditions have obviously allowed eradication even with more than 5% of fox groups without baits, which indeed can be positive in the case of scattered failure in bait coverage . However, the resulting mean bait density in the actually reached polygons was beyond 21 b.p.km2 and thus higher than the intended density of 20 b.p.km2 (Fig. 3). Distributing less baits on the same flight line pattern to arrive at an actual 20 b.p.km2 as mean local density over all hit spatial units will still satisfy the management aim but reduce costs. With a per bait cost of approx. 1 Euro (without logistics) [1, 44, 45] the retention of only 1 bait per km2 would have saved, for example, more then 200.000 Euro per year during the control programme in Eastern Germany 1990–1997 (108.000 km2 biannually vaccinated). The red fox has a territorial tenure system and several field data report the common use of space by breeding families ('spatial groups' ) even if they report different sizes [41, 48–52]. The actual objective of baiting from a management level is thus the spatial unit of 'individual fox groups' as opposed to single individuals [53, 54]. In congruence, our modelling philosophy relates the share of space to the share of baits. We are using polygonal tessellation of the fox habitat, as this is congruent with the patterns reported from tracking studies about foxes [51, 55–59] and from spatial resource allocation . The stable spatial arrangement of home-ranges assumed for one simulation run is in accordance with the temporal scale of the treatment. Because baits become unattractive or even the vaccine inactivated within 21 days , our model rules assume a spatial stability in fox foraging areas for a maximum period of 21 days. Moreover, recent data show that already within 7 days post distribution the diminishing rate reaches zero (Ad Vos, pers. comm.). Additionally, the polygon approach is capable to incorporate floaters. These roaming individuals share space with several family groups (Ad Vos, pers. comm.) thus contributing to the local density in each of these group home-ranges to certain amount which is considered in the overall fox density assumed in the model run. The partition of the complete landscape is an appropriate simplification. Spatial assemblage might be influenced by ecological resources, suitable habitat, and natural or artificial barriers, or there might be parts of the landscape that could not be used by foxes . Whereas the first issue is considered by the randomly varying size of the single polygons (comp. Fig. 2), the second issue is not important for the following reasons. Firstly, most studies on fox ecology report the complete and immediate use of any habitat patch at least for European abundance conditions . Secondly, flight patterns in vaccination areas are determined with respect to the habitat suitability, thus non-inhabitable patches (i.e. lakes) should not be targeted with baits. Even if this were the case, then the model's results would be optimistic: i.e. bait wasting increases due to the non-habitat patches. We conclude that the choice of strategic parameters in aerial baiting campaigns (bait density, flight line spacing) and the ecological background conditions (population density or spatial habitat use by the target individual) explain a part of the saturation phenomenon observed in vaccination programmes for the achieved population immunity. However, the effect of saturation is a combination of two processes 'exposure' (this study) and 'uptake' (i.e. ). We have to analyse the combination of both in our next step. In general, the imperfect 'exposure' (i.e. the amount of missed groups for a given strategy) inhibits an increase in protection by increased baiting effort. The findings encourage rather the search for spatio-temporally adjusted baiting strategies instead of continuously increasing the baiting density (see for example [23, 60, 62, 63]). Enhanced by such adjustments we recognise the general usefulness of the reference strategy if population conditions are not as bad as in middle or western continental Europe. Particularly, the future extensive control efforts necessary in large countries of Eastern Europe or the Americas would not necessarily profit from a thorough application of finer distribution (i.e. less than 1 km flight line distance). However, if non-homogeneous bait supply is identified as a source of local variation in control success then the reduction in flight line distance is an appropriate strategic adjustment. In fact, with respect to locally unsatisfactory control results, we suggest an adaptive choice of the strategic options in zoned sub-areas. We would like to thank Volker Grimm (Leipzig) and Ad Vos (Dessau) for their valuable discussion of the manuscript. HHT developed and realised the model, performed the analysis and drafted the manuscript. TS participated in model development. TM contributed the baiting details and initiated the study. TW contributed the Voronoi routine. UM and UB contributed the fox ecology and the idea behind the study. All authors read and approved the final manuscript.